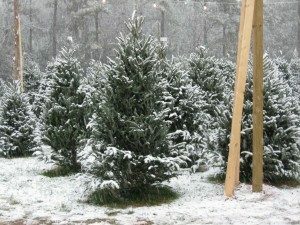 Whether you want to cut your own tree, pick a live tree and have it cut for you, buy a tree already cut or buy a living tree you can plant, this page provides detailed listings of Triangle area of North Carolina's choose-and-cut Christmas tree farms, places to buy pre-cut (also called pre-harvested and fresh-cut) trees, stands, sleigh rides, hay rides and related winter events and fun. Some listings are for tree farms, others are tree lots, and some only offer hay rides, sleigh rides or other winter events. READ EACH LISTING to know what each facility offers. The farms are listed further down this page, so scroll down the page! Since this service is free and open to ALL Christmas tree farms, not just those who belong to an association or pay for an ad, like almost all other websites do, this is the most complete and current listing available! I'm always looking for more to add, and to correct any inaccuracies or errors, so if you encounter any, please email me ! And please tell the farmer you visit in Triangle area of North Carolina that you found their farm here! I need the farmers to realize that you found them here so that they will keep their information up to date! 11814 Us 64 Hwy, Apex, NC 27523. Phone: 919-656-4693. Email: chevaliergrowers@gmail.com. Open: UPDATE: November 08, 2018: The owner tells me they are closed until next season (2019), when their hours should be: Weekends, Thursday through Sunday, from 10 am to 6 pm, through the Sunday before Christmas. Directions: On US Highway 64, two miles east of Jordan Lake, on the south side of US 64. From Apex, approximately five miles west of Highway 55. After intersection with NC 751, continue 1.6 miles west, and look for the little white house with the white picket fence on your left. Make a U-turn shortly beyond. From the west, travel about 2 miles east of Jordan Lake, about 1 mile east of Wilsonville (intersection of US 64 and 1008). Click here for a map and directions. Payment: Cash, Check. Click here for our Facebook page. Be sure to check our latest updates on our website! Our daughter, Eileen, is making her beautiful, custom wreaths again this year--be sure to call us for more details. Visit our website for pictures of a few wreaths she has made so far this year. Thank you. You Choose and We cut varieties: Arizona Cypress, Carolina Sapphire, Leyland Cypress. 2170 Martha's Chapel Road, Apex, NC 27502. Phone: 919-362-6300. Email: info@jordanlakechristmas.com. Open: 9 am to 5 pm on days we open; Closed on Mondays & Tuesdays, Our first weekend will be Saturday and Sunday prior to Thanksgiving, then Friday, Saturday, Sunday after Thanksgiving; We have a play area for the kids and of course the Bounce House will be up on the weekends (weather permitting) The Tummy Trimmings concession area will be hopping on the weekends with HOT Mini Donuts, Hot Chocolate and Cider, Drinks and of course Mrs. Ruth's Award winning jams for sale. Hayrides on the weekends (weather permitting). Diana's Christmas Shop is loaded with new and unique gift items. Wreaths, all made by us, and Garland for decorating. (Ask about custom order and decorated wreaths!). Hand-made Bows by Diana. Table-Top Fraser Firs. Ball and Burlap trees for planting after Christmas. Oh yeah.. TREES!! We have a good selection of Choose & Cut trees. Including some Virginia Pines, Leyland Cypress, Carolina Saphire and Eastern Red Cedar. Come out and "Tag" a tree on any day we open for pick up later if you want the best selection. 3514 Cannady Mill Road, Kittrell, NC 27544. Phone: 919-693-2813 or 919-395-2739. Open: Thursday, Friday, Saturday and Sunday from 10:00 till 5:00; We are closed Mondays, Tuesdays and Wednesdays; and we are open by appointment.. We bring in a select few Fraser Firs from the NC mountains. We allow pre tagging of trees starting the weekend before Thanksgiving. We are members of the ENCCTGA. Please come out and enjoy a the choose and cut experience. Directions: Between Wilton and Oxford just off highway 96. Half mile north of Tar River on Cannady Mill Rd. 1620 Loop Road, Clayton, NC 27527. Phone: 919-553-0016. Open: October: All Saturdays, Sundays 12 pm to 10 pm; Varies Thursday to Friday 12 pm to 10 pm; November and December: Friday to Saturday to Sunday 6 pm to 10 pm. Directions: from highway 70 in Clayton turn beside Bojangles. Go through the stoplight and turn Right onto Covered Bridge road. Go to the stop sign and turn Left onto Covered Bridge Road again. Turn Right onto Loop Road. Our Farm is located about 1/2 mile on the Right. Click here for a map and directions. We open September and Close the last day in October; For our Christmas event we open the day after Thanksgiving, and Close the day after Christmas. Payment: Cash, only. 1660 Cornwallis Road, Garner, NC 27529. Phone: (919) 553-2672. Alternate Phone: (919) 268-3112. Open: Sunday and Saturday from 8 am to dark from after Thanksgiving thru Christmas Eve. Red Cedar 5-8 feet, White Pine 5-7 feet & Virginia Pine 5-12 feet.. Pre-tagging of trees by customers beginning November 1. Directions: Located at 1660 Cornwallis Road, Garner, NC. From I-40 take exit 312, go approximately 1.8 miles on Hwy 42 east, turn right onto Cornwallis Road and go 3.75 miles. Look for large sign on left, farm 1/2 mile from road. Follow signs down farm path. From NC 50 between Benson & Garner, turn east on Old Drug Store Road just north of Middle Creek Bridge, go .4 mile, turn right on Cornwallis Road, go 1.6 miles & look for sign on right. 7326 Meadowbrook Road, Benson, NC 27504. Phone: 919-894-3524. Open: Monday to Friday 3 pm to 6 pm, Saturday 9 am to 6 pm; Sunday 1 pm to 6 pm. We also offer live container plants such as Norway & Blue Spruce and Hemlock Dwarf Alberta Spruce White Pine, Bring the kids--after all, Christmas is for children. Let them romp over the fields while selecting that special tree or take a crisp winter stroll around the lake or woods. With over thirty years of growing Christmas trees, we strive to produce the finest top quality trees for your holiday festivities. Choose from White Pines, Leyland Cypress (tabletop to 10 ft.), Norway Spruce, and Concolor and Canaan Fir. You can also choose a live tree to use in your landscape after the holidays. Living, rooted tree varieties: White Pine, Norway Spruce, Canadian Hemlock, Dwarf Alberta Spruce and Deodora Cedar. 5368 Wilson's Mills Road, Clayton, NC 27520. Phone: 919=934-6918. Fax: 919-934-0429. Email: wilsonsfamilymarket@dockpoint.net. Directions: Call for directions. And for a map to our farm, click here. Crops are usually available in All year. Open: Tuesday to Saturday, 8 am to 6 pm, Sunday, 1 pm to 5 pm, Mondays: closed; Call for seasonal hours. Strawberries: Mid April, Pumpkin Patch: Starts October 1st, Christmas Trees: Day after Thanksgiving till Christmas Eve. Payment: Cash, Check, Visa/MasterCard. Nahunta meat products, hoop cheese, canned goods, seasoned and cooked coolards and turnip greens, butterbeans, peas, hot house tomatoes, homemade baked goods, flowers, shrubs, gift items. 6488 Main St, Bailey, North Carolina 27807. Phone: (252) 235-4836. 4462 Stoney Hill Church Road, Bailey, NC 27807. Phone: 252-235-2221. 1715 Street mary's Road, Hillsborough, NC 27278. Phone: 919-619-2145. Email: smithsfamilyfunfarm@gmail.com. Open: Monday to Friday 3 pm to 8 Sat 9 am to 8 Sun 9 am to 7. Directions: 3/4 miles off of highway 70. For a map to our farm, click here. Storytime with Santa. Payment: Cash, Debit cards, Visa/MasterCard, Discover. You Choose and We cut varieties: Eastern Red Cedar, Eastern White Pine. 3390 John Adams Road, Willow Spring, NC 27592. Phone: 919-567-1010. Email: marketing@adamsvineyards.com. Open: Monday to Saturday, from 3 pm to 8 pm, starting the day after Thanksgiving till around December 15. Directions: Click here for a map and directions. Payment: Cash, Debit cards, Visa/MasterCard. Click here for our Facebook page. 4533 Inwood Road, Raleigh, NC 27603. Open: 9-5 everyday until Christmas. Directions: From Cary, come east on Tryon Road to Lake Wheeler Road. From Durham and points west follow Interstate 40 east to Gorman Street, Exit 295. At ramp end, turn south onto Gorman, come one quarter mile to Tryon; turn left onto Tryon, and come 1.3 miles to Lake Wheeler Road. In our "organic field" where the trees have not been shaped, upon request, we will provide additional shaping/shearing of our home grown trees to make the tree perfect for you. We have a great selection of Fraser Firs ranging in size from 6.5 to 9.5 feet tall. Since Fraser Firs do not grow in this area, they are shipped in from Sparta, NC. The Frasers are very fresh and have only been cut down within the past week. Our mission is not just to sell trees, but to provide a fun-filled outing for the family. Bring the children and let them romp among the trees. Let them run and yell and have a great time. But, please warn them to be careful and watch out for tree stumps so they don't fall. Click here for a link to our Facebook page . A visitor writes on November 25, 2018:"the only trees we saw were Fraser fir. we went Friday all the frasers were at least $75, and not over 8ft." 2813 Mount Vernon Road, Raleigh, NC 27613. Phone: 919-848-8264. Email: info@boycefarms.com. Open: Monday-Friday: Noon - 7 PM, Saturday-Sunday: 9 am to 7 PM, from the Day after Thanksgiving until December 23rd. have a memorable experience selecting their Christmas tree. We provide saws or we will gladly cut it for you, net it for easy transporting to your home, and load and tie it on your vehicle at no charge. You may bring your own saw, but we do not allow chain saws. Brock's Tree Farm - The owner writes on November 24, 2016: "Brock\'s Tree Farm is permanently out of business due to health issues. " 8317 Lawdraker Road, Apex, NC 27502. 1132 Morrisville-carpenter Road, Cary, NC 27519. Phone: 919-481-2435. Email: ferrells@greenacrescary.com. Open: Friday after Thanksgiving thru 12/21. Click here for current open hours, days and dates. Directions: From highway 55, take Morrisville-Carpenter road 1.5 miles. We are directly across from Carpenter Village. From Davis Drive take Morrisville-Carpenter road west 1/2 mile. Click here for a map and directions. Corn maze Labor Day weekend thru Halloween Christmas trees Friday after Thanksgiving thru 12/20. Payment: Cash, Check, Visa/MasterCard, Discover. We only offer pre-cut Christmas trees. Click here for our Facebook page. Greenlevel Gourd Farm - No trees - Christmas hay rides, Gourds, gourd crafts, hot cider and hot chocolate, Christmas gift shop. 3800 Greenlevel Road West, Apex, NC 27523. Phone: 919-387-7352. Email: sandrajockisch@att.net. Open: Sunday afternoons during the month of December from 1 pm to 5 PM. Gourd gift shop hours 1 pm to 5 PM Tuesday thru Sunday year round. Christmas hay rides are offered on Sunday afternoons, during the month of December along with hot cider, hot chocolate and Christmas gift shop. Directions: Greenlevel Gourd Farm is located at 3800 Greenlevel Road. West. Take Hwy 64 West to Greenlevel Church Road. Turn on Greenlevel Church Road and travel 2.7 miles to Greenlevel Road West. Turn left and travel to 6th house on right.Hay rides are $3 a person. The gourd gift shop is open 6 days a week year round. It features seasonal decorations and unique gifts for everyone. You will find everything from baskets, bowls, Christmas decorations and ornaments, and jewelry made from the versatile gourd. Christmas hay rides, hot cider and hot chocolate, Christmas gift shop available Sunday afternoons during the month of December. Sunday afternoons during the month of December from 1 pm to 5 PM. Gourd gift shop hours 1 pm to 5 PM Tuesday thru Sunday year round. 8824 Poole Road, Knightdale, NC 27545. Phone: (919) 217-0411. Email: kirkfarms@bellsouth.net. Open: Monday to Friday 7 am to 7 pm, Saturday 7 am to 5 pm. Crop availability: Christmas Trees - November 25-December 24. Mulch, Crop Compost, Wheat & Pine Straw. Directions: Located 6 and a half miles east of I-440 off Poole Road exit 15. 6817 Indian Wells Road, Cary, NC 27519. Phone: 919-427-4738. Alternate Phone: 919-616-4890. Fax: 919-542-4483. Email: tphillips@phillipsfarmschatham.com. Open: Monday through Thursday: 11 am to 8 pm; Friday: 10 am to 9 pm; Saturday: 8 am to 9 pm; Sunday: 9 am to 8 pm. Directions: Corner of Highway 55 and Indian Wells Road; about 7 miles south of Interstate 40 and Highway 55 intersection; 5 miles north of Highway 64 and Highway 55 intersection. Click here for a map and directions. Pumpkins: Early September through October 31 Christmas Trees: Thanksgiving Friday through December 22. Payment: Cash, Check, Debit cards, Visa/MasterCard, Discover. We also carry wreaths, roping (garland) and bows. If you do not see what you want in our wreath display, we would be happy to make one to order for you! We carry white pine, fraser/white pine mix, and fraser fir roping in 25 ft. and some in 75 ft. lengths. We have Pre-cut Christmas trees and Choose & Cut trees available in Chatham County at our farm. Pumpkins, gourds, mums, and other Fall decorations are available during the Fall. PreCut varieties: White Fir (Concolor Fir), Eastern White Pine, Fraser Fir. Wagoner's - Christmas Trees, Christmas Tree Live, Wreaths, Choose & Cut Christmas Trees, garland, accessories and decorations, machine-shaking and net-bagging of trees. 5513 Falls of Neuse Road, Raleigh, NC 27609. Phone: (919) 301-8733. Or Phone: (919) 571-3432. Directions: On I-440 take exit 10 (Wake Forest Road) and head North from I-440 go 2 and a half miles. The road name will change to Falls of Neuse Road. The lot will be on left. Look for the 40 ft. snowman. Open: Day after Thanksgiving - December 23; Weekdays and Saturdays 9 am to 9 PM, Sundays 12 pm to 9 PM. U-Choose & Cut your own: Fraser Fir 3 - 15 feet, White Pine 4 - 9 feet, Colorado Blue Spruce 5 - 6 feet.